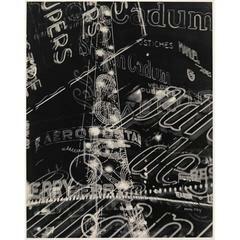 Rayograph Héliogravure by Man Ray for Compagnie Parisienne de Distribution d'Electricité,1931. Printed in Heliogravure and signed in the negative 500 copies. Man Ray (1890–1976) was an American visual artist who spent most of his career in France. He was a significant contributor to the Dada and Surrealist movements, although his ties to each were informal. He was best known for his photography and he was a renowned fashion and portrait photographer. 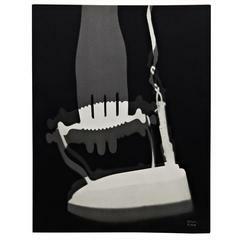 Man Ray is also noted for his work with photograms. 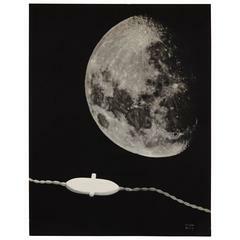 Color lithograph with geometric motif by Man Ray, 1960s (signed and numbered 70/99 on front). In original artisan frame. Rafael Canogar Black and White Limited Edition Lithograph "EL Abrazo"
Leonard Baskin Wood Engraving Limited Edition Print "Man with Spring Flowers"